The year of fruit beers continues apace. 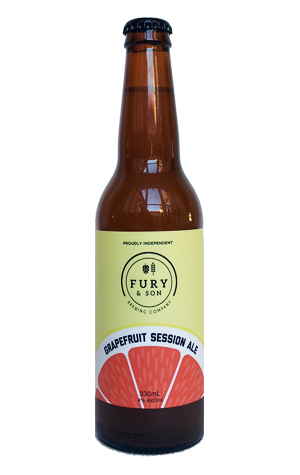 This time around, it's grapefruit taking centre stage and doing so not in a sour or an IPA but in a humble little session ale. And when we say "centre stage" we mean it as the 400 litres of fresh, unprocessed grapefruit juice the Keilor Park brewery obtained from Mildura are far and away the dominant character. They've been added to a pale, unobtrusive base beer, creating a hazy, um, juice like appearance in the glass. There's some American hops in there too to add a little drying balance, but from the off this is all about the grapefruit: lively on the nose and bittersweet on the palate in a beer that's low in booze content for those seeking something refreshing as the warm end to summer stretches into spring. There's a couple of dozen kegs and rather more cases going out into the world so expect to see the stockist list grow.